Plenty of stories are out there about celebrities behaving badly, or feuds online that get bigger and messier until no one can stomach the interactions anymore because it only reminds them that human beings are largely trash beings. 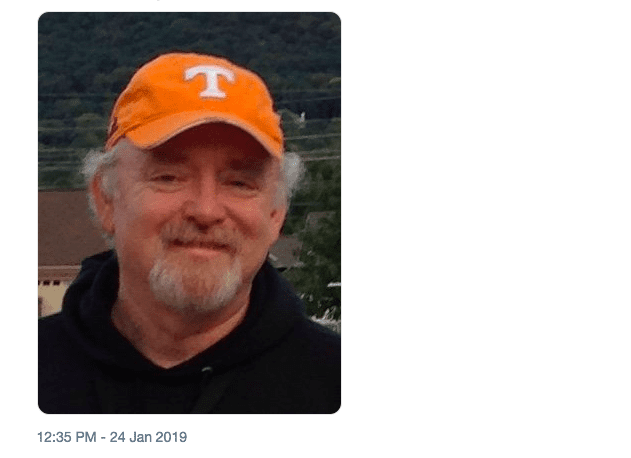 It began when a man named Michael Beatty tweeted some mean comments at actor Patton Oswalt, but instead of getting riled and firing back, Oswalt decided to learn more about his random cyberbully. 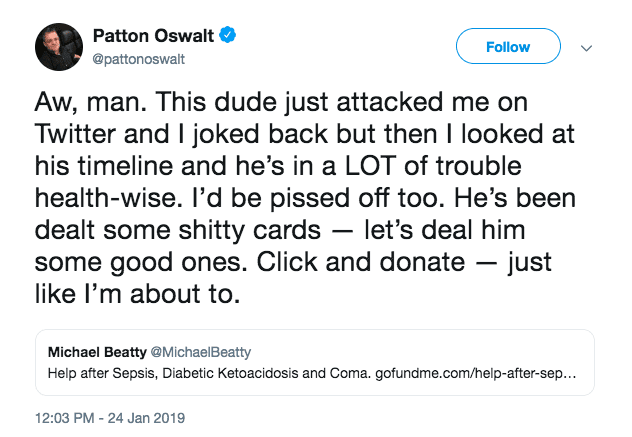 When he learned that Beatty was a Vietnam vet struggling with multiple medical issues, Oswalt did the opposite of feuding…he took to Twitter to ask for help raising money to help the guy out. 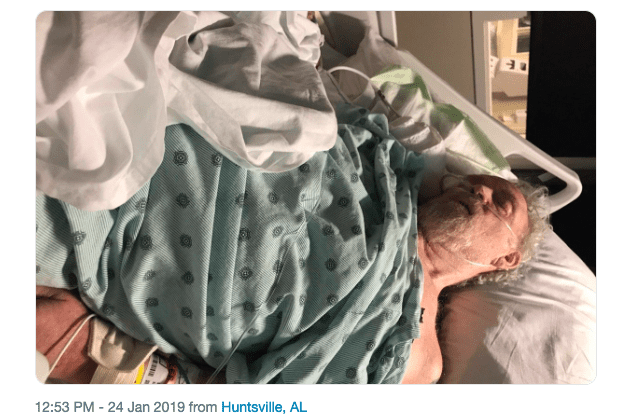 Oswalt said he was donating to Beatty’s GoFundMe, which was set up to help the man pay for treatments related to sepsis and diabetic ketoacidosis – he was unable to pay his hospital bills. According to his GoFundMe page, he spent two weeks in the hospital and nearly died. Like many Americans, he found himself unable to pay for the expensive, lifesaving treatment. Oswalt also shared the GoFundMe page and encouraged his own followers to donate, and boy, did they respond. Beatty’s goal of $5,000 was met and exceeded, with Oswalt’s followers raising more than $33,000. 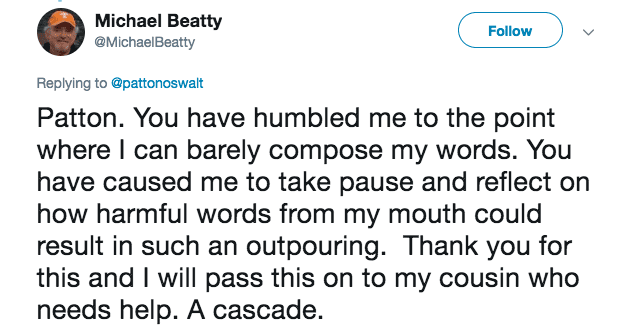 Beatty was floored by the response, and humbled by the kind response to his unkind words. 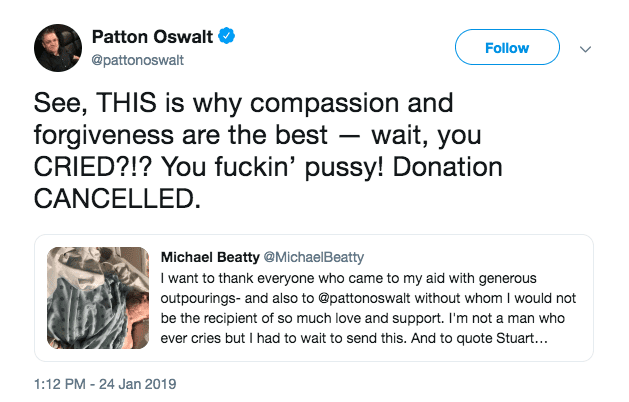 True to form, Oswalt responded that Beatty himself could pay the love forward however he could, whether by donating to the GoFundMe of a furloughed federal worker or hauling some cans to his local food bank. 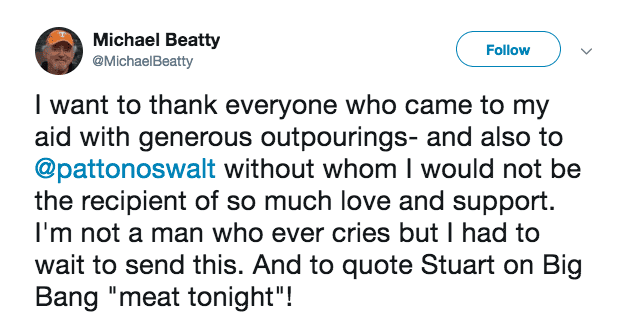 And when Beatty confessed to crying over everyone’s generosity, Patton had a hilarious, classic response for that, too. This has been your feel-good story of the week – go forth and pay it forward yourself!